Have you ever heard about overselling in web hosting business? Generally, overselling means too much selling something, which can be the opposed of overstock. Okay, enough for scrubby talk, let’s get serious. *I’m not counting this spec allocation with full resource, i assume the residual resource is reserve for server’s system. So from my explanations above, you maybe do overselling by creating for example 200 accounts with that kind of server. You are expecting that your clients don’t use all of their resource, especially disk space and data transfer. And to prevent your client for using full resource of your package that you promised, you restrict them with general TOS like: prohibited to use for file hosting, peer to peer application, cpu large consume script such as CGI, Proxy, etc. Those kinds of TOS is very common and understandable in the web hosting business, but the disaster thing will come to you overselling provider when the client’s website is not use the restricted script or service but their website get about a thousand unique visitor a day and accidentally the website is full with large size of images, or simultaneously receive a thousand request. With the normal 60 clients, that kind of condition can overwhelmed the server, what about if you do overselling and you accidentally experiencing that kind of circumstances? Can be worst! What would happens? Bandwidth limit exceed, fatal out of memory, slow response to the website (long time process), etc. Your email inbox will be full by your client’s tickets, complains, refunds, invectives, and another unpleasant emails. Is that good? Of course not! In my experience, good service provider will do response all of those ticket with good manner and resolve all of those problems, maybe upgrade the server spec or do refunds. But the bad or evil or terrible provider will not response all of the tickets, not do refunds, keep overselling until the server’s blow up and then dissapeared like they swallowed by the earth. 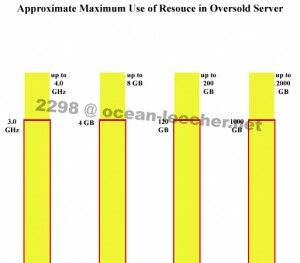 Non oversold server will stil be safe if their clients use maximum resource simultaneously, but in most case cpu and memory usage will sometimes exceed or boost to the top of your server’s spec limit, you just need to reboot your server to refresh cpu and memory, or maybe upgrade both cpu or memory. For the oversold server, you probably can also do reboot to refresh cpu and memory, but what about disk space and data transfer? Could you press reboot and refresh them? Haha… lol. Is it good to do overselling? Or is it good to buy web hosting from the overselling provider? Overselling of course is good to maximize profit and it is not prohibited, but you service providers must keep in mind that you need to be ready to upgrade your server, especially disk space and data transfer in case your server is not enough no more to serve your client’s disk space and data transfer, if you don’t have problem with that, then you are a good overselling provider. For the customer, if you want to go with the overselling provider, then you must be looking for some good spec with very affordable price. You need to do research about the service provider candidate before you decide to go with them. Check how long they have been in business, testimonials, etc. Find all of those information in a community or forum which the provider sell their service, so if there is some trouble you can easily contact them in the forum or if in the worst case they do not respond your query, just post in the forum your testimonial about them with the proof or evidence like maybe screenshot. One last important thing, i want to tell you that there is no such thing “Unlimited Disk Space” or “Unlimited Data Transfer”.